I've been reading Joy Hakim's A History of the U.S.: From Colonies to Country. A revelation. In my education back in high school, the mid-1700s in American history was much overlooked. For instance, I'd never heard of Warraghiyagey (Mohawk for "he who does much"), aka William Johnson. William Johnson was an unknown young man with a rich uncle and no money of his own. Right away, he did a very sensible thing. 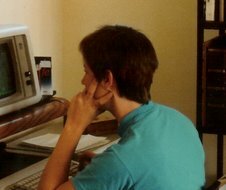 He met his neighbors, the Mohawk Indians, and learned their language. Immediately, he liked them, and they liked him. ... Johnson soon learned the ways of the Mohawk and was named as one of them. 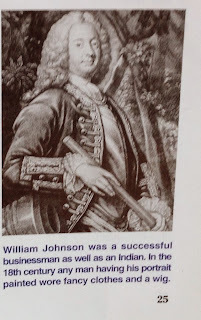 Johnson's biographer said, "Sir William was a well adjusted European man; Warraghiyagey thought and acted as an Indian. These two personalities lived together without strain in one keen mind and passionate heart." Warraghiyagey married a Mohawk wife, Degonwadonti, also know as Molly Brant. And he worked hard on treaties with the Iroquois, persuading the Indians to fight for the British, promising that their land would be protected. Hakim adds: "and he thought he could honor that promise." Well, we know how that turned out. Still, it is intriguing that the man could be a landowner, living "like a feudal lord in a great big mansion," but also meet with the Iroquois at a council fire lit on his property and lead those same Iroquois to British victory against the French and Indians at Lake George. However did he manage it? Here's a picture in A History of the U.S.: From Colonies to Country. The caption notes that "In the 18th Century, any man having his portrait painted wore fancy clothes and a wig." Does he wear a mohawk haircut under that wig? I wondered. Since he had a town named after him -- Johnstown, NY -- I looked on their website and found a second, less wiggish portrait. Or is that another wig? Hard to tell. In any event, "the painted warrior named Warraghiyagey became a romantic hero, and the English king made him a baronet." 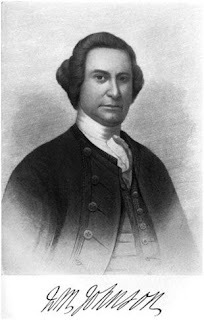 Sir William Johnson. Okay, quite possibly, it wasn't the hair that made the man. It's said what William Johnson cared about was not what people believed, but the way they behaved. "Anyone kind and decent became his friend" regardless of their station in life. When it came to character, it seems, Johnson wasn't duplicitous in the slightest.